21st October, 2015 [LONDON]: When the people from Glenfiddich, the Maverick Whisky Makers of Dufftown, began to search for a suitably fitting way to celebrate their 21 Year Old liquid, an exceptional single malt nurtured in Scotland and finished in rum-infused casks from the Caribbean, the journey led them to a ground-breaking meshing of science, art, music and motion – and a transformation of the whisky into a visible expression of itself. 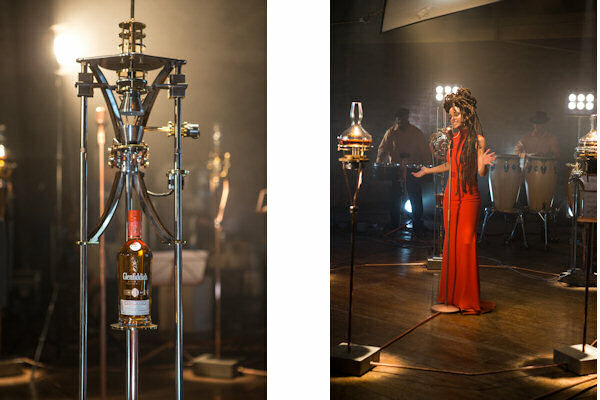 In this ambitious project which spanned twelve months and brought together a diverse ‘cast’ including experts in the science of Cymatics - the study of visible sound waves - Caribbean vocalist, Calma Carmona, and the Co-Operative Orchestra Scotland, Glenfiddich has conducted a revolutionary experiment designed to explore the effects of live music on single malt. Inspired by the whisky raised in Scotland and roused by the Caribbean, a Franz Ferdinand track, Love Illumination, was selected as the experiment’s catalyst, with a new interpretation fusing the musical heritage of both cultures through powerful Scottish orchestration and Carmona’s distinctive Caribbean vocal. This unusual artist collaboration provides the perfect metaphor for the unique qualities of the single malt that is matured for 21 years in Scotland and then given a vibrant twist by finishing for four months in Glenfiddich’s own Caribbean rum casks. The artists performed the unique track in a London warehouse in real time to an ‘audience’ of bespoke, precision-crafted devices, developed by creative laboratory TenHertz, and manufactured to capture the various cymatic effects of the music on the 21 year old liquid. Each device was specifically attuned to respond and react to different note ranges and sound frequencies, isolated through a speaker via specially programmed software. Vaguely reminiscent of classroom chemistry flasks, but infinitely more sophisticated, the Decanter devices produced horizontal pulses and vibrations associated with the stringed instruments and Calma's vocals. Additionally, the Double Helix and Zig Zag devices manifested air twists and zig zag patterns created by flowing whisky in response to the double bass and percussion of the orchestra and band. Most spectacularly a fourth device, the Levitron, isolated one drop of ‘levitating’ single malt between two ultrasonic transducers in mid-air. This spectacular result, the whisky in suspended animation, was created by the notes of the song's finale; the first time that this has been witnessed outside of a laboratory. Beautiful, rhythmic, and at times, mesmeric, the controlled but seemingly organic movement of the whisky, in tandem with the power and sweetness of the music, creates a compelling fusion of art and science, and a suitably emblematic motif of Glenfiddich’s single malt making heritage, which has always combined maverick spirit with dedicated precision. The full experiment, and the dramatic impact of the sound on the whisky, was captured in a compelling film released today and available below after the 21 Year Old Glenfiddich tasting notes. Nose : Intense and vanilla sweet. Floral, hints of banana, figs, rich toffee, new leather and oak. Taste : Initially soft, then brisk, vibrant and drying, peppery, a touch of smoke, oak, lime, ginger and spices. Finish : Very long, warming, dry and spicy.